2019 Updates and Events will be HERE!! Stay up to the on our Event Calendar for the latest. You are invited to participate with specials: Click here to Sign up and join our Buy Local Santa Monica Committee partner and help us celebrate! We will promote all our participating Santa Monica business and their specials in May! Interested in supporting #BikeLocalSM with specials for our local folks on bikes beyond Bike Month – email here for info! 2018 Updates and Events are HERE!! Check out our Event Calendar for the latest. You are invited to participate with specials: Click here to Sign up through our Buy Local Santa Monica Committee partner and help us celebrate! Click the bullets for complete info. Please check back for added links and new additions! Nation Bike Challenge Begins. Log miles over smiles from May 1st to September 30th. Join Team Bike Santa Monica in this National Competition. More info online. Every Wednesday Camp Coffee, #CoffeeOutside at Ballona Creek 7:00-8:00am. Bring your camp brew kit or ready made, It’s a great way to start your day. On the jetty at the end of Ballona Creek Bike Path past the bike bridge. Every Thursday in May Handlebar Happy Hour – Celebrate all things bike as we explore our Santa Monica Buy Local, Bike Local business. This month we visit the Most Loved SM Happy Hour Finalists. Areal, The Craftsman, Rusty’s and Upper West. Friday, May 13th Big Blue Bus Buy One Get One stock up on your BBB fare! Sunday, May 15 – Breeze Bike Share Community Ride & Bike Route Tour 10am – noon, meet at 17th Street Expo station. We’ll ride and explore the new Expo II Bike Path! Meatless Monday, May 16 – Ride & Fundraiser to the Veggie Grill – We meet at Colorado Center Park at 5:30 to ride (or meet us) at Veggie Grill, 2025 Wilshire blvd. Visit Veggie Grill anytime during the day and SANTA MONICA SPOKE – 33% of what you spend gets donate to us! Wednesday, May 18th Special Edition Bike Week Camp Coffee #CoffeeOutside at Ballona Creek 7:00-8:00am. Bring your camp brew kit or ready made, It’s a great way to start your day. On the jetty at the end of Ballona Creek Bike Path past the bridge. Guided SM City Bike Tour. We’ll check out the new Esplanade & cycle track, then ride some of the great bike facilities that earned Santa Monica its Silver Level Bike Friendly City Designation. We ride to a bonus Handlebar Happy Hour, check the calendar for latest updates. Thursday, May 19th is Bike to Work Day! Sponsored by Metro Visit our website for a full list of Santa Monica pit stop locations. We will be at City Hall as well as several other locations. Bike From Work Handlebar Happy Hour: TWO in Santa Monica! We will be at Areal 2820 Main Street Main St and Public Bikes 2714 Main St is hosting a Bike From Work Handlebar Happy Hour that benefits Santa Monica Spoke. WOOT!! So FUN and so close – you can do BOTH! People on bikes Ride Metro and Big Blue Bus for Free today! Saturday May 21st Expo II Station Parties. Visit all three stations, each is themed differently – we plan to be at all three Santa Monica stations. This historic event is one not to be missed. 10am-4pm all stations. Sunday, May 22nd Santa Monica Spoke Family Bikes on Expo Tour. Let’s go multi-modal with the whole family. We start at 17th Expo Station take a short ride on the Expo II Bike Path and then jump on Expo to Exposition Park for a short ride around the Rose Garden, then back to Santa Monica. Fun for the whole family. Start time planned for 10am, final details posted to the website soon. Bike + Train Tour SM Learn to connect bikes to transit with PUBLIC Bikes & Sustainable Streets, free Breeze ride and tap card! 10am- 4pm meet at 2714 Main St.
Orchestra Santa Monica concert “From France to Vienna” @ 2:30 pmMoss Theater Special: Arrive by bike and save up to 33% or bring a selfie of you on a bike. Adults $20 (instead of $30), College $10 (instead of $15), K-12 $5 (instead of $10). Purchase tickets at the door or RSVP here for link to purchase tickets in advance. Wednesday, May 25 Movie Screening: CARLESS in LA and BIKE RIDE to the Laemmle Monica. CARLESS in LA: one woman’s car-free trek thru Los Angeles. Move starts at 7pm Panelist and Q&A Discussion to follow. A group will meet earlier at the 17th Street Expo Station (Station may change) to ride to the theatre to arrive by aprox. 6:30pm. Please see event for final updates and to rsvp. Thursday, May 26th Handlebar Happy Hour at The Upper West. Close out Bike Month with Bike Night at Union Station! Friday, May 27th Bike Night is more than just bikes: music from Jungle Fire, raffles and games, awesome prizes from Public Bikes and Tern Bicycles, and the highlight of the evening, a bicycle fashion show! Bike Week LA is an annual week of community events sponsored by Metro and local advocates all over the County of Los Angeles to promote bicycling as a sustainable and practical mode of transportation. Check Metro website for events all over LA. In Santa Monica we have you covered, to get connected in your area look up LACBC, or your areas LACBC Local Chapter. Santa Monica Spoke we will again participate and host rides and events through out the week! More info on these rides and events is coming soon Check out our Event Calendar for the latest. Saturday, May 9th: Santa Monica Festival, with a BIGGER BIKE ZONE, Family Bike Hub, Kids Skills Course and the 5th Santa Monica Spoke Bike Exhibition! Sunday, May 10th: Get ready with fix your bike day & Bicycling is for Everyone! Get that bike out, tuned and ready for the weeks events. What better plans for Mother’s Day? Go on a bike ride with the whole family. Getting out on you bicycling is the perfect family-friendly activity for a leisurely Sunday. Santa Monica Spoke: Meatless Monday Ride to Fundraiser at the Veggie Grill! Veggie Grill will donate 50% of all receipts* when customers mention Bike Week LA or Santa Monica Spoke! Ride starts at 5pm from the Park at Colorado Center. Ballona Creek Camp Coffee – Special Bike Week Edition – coffee & breakfast outdoors! Enjoy a Guided Tour of some of our new local Bike Infrastructure. Give input, ask questions and hear about what’s up next – We finish the tour at Vidiots for a free movie screening. Thursday, May 14th: Bike to Work Day & Bike FROM Work Handlebar Happy Hour! Ride Big Blue Bus for free today with your bike! Extend your commute with your bike on bus! Metro and many municipal transit carriers free all day Thursday if you board with a bike! Color Wheels: Bicycle Community Art Show at CalTrans details here. Go out on a Bike Date – with friends or that special someone! Bike Locally! Ride your bike to eat, play or shop, take advantage of special discounts just for bicyclists! Locally Buy Local is now also Bike Local – Because bicyclists are great for local business! Bike Week LA is an annual week of community events sponsored by Metro and local advocates all over the County of Los Angeles to promote bicycling as a sustainable and practical mode of transportation. Did you take the pledge? Pledge here to ride your bike on Bike to Work Day and you could win cool prizes! Santa Monica Spoke hosts rides and events all week – (and all of MAY)! Check out our Event Calendar for the latest. Check Metro website for events all over LA. In Santa Monica we have you covered, to get connected in your area check out LACBC or your areas LACBC chapter or Bike Ambassadors. Saturday, May 10th – Get ready / Fix your bike day! Get ready with fix your bike day. Local shops will host safety checks to help get your bike in good running order. Sunday, May 11th – Bicycling is for Everyone! Metro Kick-off Bike Week at Union Station – South Patio. Local and regional transportation agencies, bicycle advocacy groups and more will participate. Meatless Monday Fundraiser Ride in Santa Monica, Veggie Grill will donate 50% of all receipts* when customers mention Bike Week LA or Santa Monica Spoke! We start at 5pm at the Park at Colorado Center. Wednesday, May 14th – Guided Ride Day: Bike Lanes and More! Handlebar Happy Hour, with snack and beverage specials just for us! Thursday, May 15th – Bike to Work Day & Bike FROM Work Handlebar Happy Hour! Bike to Work Day Pit Stops, we again join City of Santa Monica at City Hall on Main Street and again also Co-Host a Bike Commuter Pitstop with Co-Opportunity at 16th & Broadway 6:30-9am. Friday, May 16th, – BIKE DATE NIGHT! & Metro Bike Night at Union Station Metro and their LA County partners will host a BIKE WEEK LA Wrap-up evening event at the Fred Harvey Room and courtyard at Union Station. This free event will feature special guests, live music, food trucks, outdoor booths, free bike valet, bike shorts, trivia, bike portraits and a fashion show. There will also be a raffle for great prizes! How about a group ride to Union Station from Santa Monica? 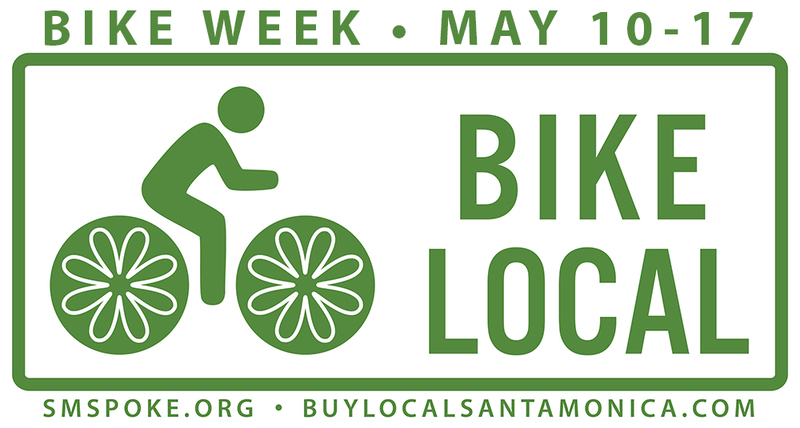 Saturday & Sunday, May 17th & 18th – Buy Local / BIKE LOCAL Weekend! Bike Locally! Ride your bike to eat, play or shop, take advantage of special discounts just for bicyclists! Santa Monica Spoke and Buy Local Santa Monica have been coordinating to launch BIKE LOCAL Santa Monica. We and our partners have been hard at work signing up business to participate. Buy Local is now also Bike Local – Because bicyclists are great for local business! This page will keep you updated on the local events here in Santa Monica as well as in and around LA. There are lots of events and rides planned for Bike Week sponsored by Metro here in Los Angeles County, and LOTS of special events planned here in Santa Monica! Pledge here to ride your bike on Bike to Work Day and you could win a new bicycle from REI and other great prizes! Click on the day of the week to see a list of local participants and events here in Santa Monica. These pages will be updated as events are confirmed, added or sent in from you all to post. May 13—Monday, Fix Your Bike Day Tune up an old bike or build a new one – learn to do it yourself! May 14—Tuesday, Lady’s Choice, Blessing of the Bicycles Take your bike to the 10th Annual Blessing of the Bicycles. May 15— Wednesday, Guided Ride Day: Bike Lanes and More! Bicycle lanes are sprouting up everywhere – come take a tour! May 16—Thursday, Bike to Work Day Give bicycling a try and get refreshed at the pit stop nearest you. May 17th—Friday Bike Night at the HAMMER Grab some friends and ride there with us! May 17-19—Bike Local Weekend Ride your bike to eat, play, or shop!